The Polo brothers decided to avoid Crimea, because of a civil war between Berke and his cousin Hulagu or perhaps because of the bad relationship between Berke Khan and the Byzantine Empire. Instead, they moved further east to Bukhara, in modern day Uzbekistan, where the family lived and traded for three years. Crossing the Volga River and travelling around the northern end of the Caspian Sea, the Polo brothers, traversed the dry steppes of Kazakhstran and Usbekistan to the ancient city of Bukhara. The Mongols had captured and destroyed the city in 1220. When the Polos arrived, it was one of the chief cities of the Chaghatai Khanate. The brothers stayed in Bukhara for three years, waiting for the unrest in the western khanates to end. It must have been an unrest of three years, but it may have given the Polos a chance to learn the Mongol language, Perhaps they also still had goods to sell in the city, whick was an important stop along the east-west overland trade routes. 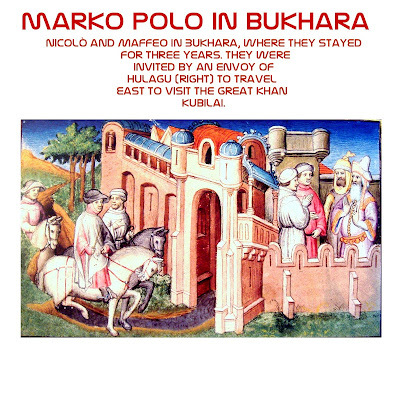 Unfortunately for Marco, only Marco Polo's father, Niccolò (also Nicolò in Venetian) and his uncle, Maffeo (also Maffio), were in Bukhara. But as written by Rustichello da Pisa “Ma ancora v'à di quelle cose le quali elli nonvide, ma udille da persone degne di fede” And still have things which he had not seen, but he had heard it from faithful people. In Sanskrit word "Bukhara" means "monastery". Here you can find more than 140 architectural monuments and architectural masterpieces. 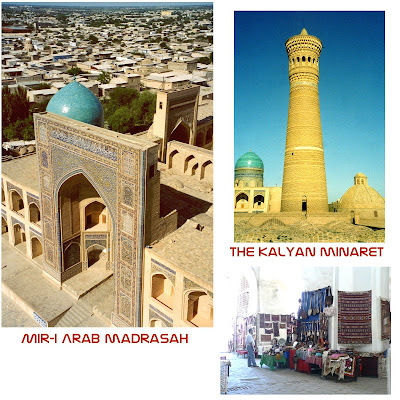 Bukhara is a "museum city" under the blue sky. Bukhara (Uzbek: Buxoro, Tajik: Бухоро, Persian: بُخارا, Russian: Бухара), also spelled as Bukhoro and Bokhara, from the Soghdian βuxārak ("lucky place"), is the capital of the Bukhara Province (viloyat) of Uzbekistan. The nation's fifth-largest city, it has a population of 237,900 (1999 census estimate). Who are you / Who is it?